Gregory Ratoff (Born Grigory Vasilyevich Ratner; Russian: Григорий Васильевич Рэтнер, tr. Grigoriy Vasil’evich Retner; April 20, c. 1893 – December 14, 1960) was a Russian-born American film director, actor and producer. His most famous role as an actor was as producer Max Fabian in All About Eve (1950). Ratoff was born in Samara, Russia, to Jewish parents, Sophie (née Markison) and Benjamin Ratner. His mother claimed to have been born on September 1, 1878, but was married on June 14, 1894, when she would have been 15, to Benjamin Ratner (born 1864 – died 19?? ), with whom she had four children, the eldest of whom was Gregory, whose date of birth she gave as April 7, 1895 (see ) but later April 20 was cited as Gregory Ratoff's birthdate, and the year was given as 1893, 1896 and 1897, variously. Sophie Ratner would later adopt her son's stage surname (Ratoff) when she herself became a naturalized United States citizen. She died on August 27, 1955, and her date of birth is given as September 13, 1877 in the "California, Death Index, 1940-1997". Ratoff was pursuing a law degree at the University of St. Petersburg until his education was interrupted by service in the Czar's army in World War I. After the war, he abandoned law to join the Moscow Art Theater, where he began to make a name for himself as an actor. An eyewitness to the chaos of the Bolshevik Revolution, Ratoff fled Russia with his parents in 1922 and settled in Paris, where he also wooed Eugenia Leontovitch (later known as actress Eugenie Leontovich), the daughter of a Czarist army officer, who, too, had escaped to Paris. They were both performing in a Paris production of the Russe Revue in 1922 when the famous New York impresario, Lee Shubert, founder of the Shubert Theaters, brought this show to Broadway, and the young couple along with it. They decided to stay in the United States, and the couple married on January 19, 1923. Leontovich gave Ratoff's year of birth as 1896 in her naturalization papers but did not include the month or day. A border crossing manifest, dated September 23, 1922, gives both her age and that of Gregory Ratner as 29, indicating 1893 as the year of birth of both (see ). Ratoff joined in the thriving Yiddish theater in New York City, producing, directing and acting for the Yiddish Players as he became something of an theatrical impresario, even performing in a Yiddish film. He graduated to Broadway later in the decade, appearing in Shubert productions as he learned English, though his mastery of the language would always be heavily accented and this, in fact, would become his stock-in-trade in his busy future career as a character actor. When the Depression hit Broadway, Ratoff headed to Hollywood, as part of the exodus of New York theater pros who were quickly snapped up by producers terrified of films with dialogue, the "talkies". He arrived in 1931 and caught a lucky break: in Gregory La Cava's Symphony of Six Million, producer David O. Selznick had insisted, very unusually for the time, that this Fannie Hurst story of a brilliant Jewish doctor escaping his tenement roots be cast with authentic Yiddish actors from the Lower East Side. His role as the beloved immigrant father who dies on his son's operating table led to five more jobs in 1932 alone, ranging from a George Kaufman comedy to a prestigious Selznick production, George Cukor's What Price Hollywood?. With these early critical and box office winners, Ratoff was in constant demand as a character actor throughout the 1930s, many in B-pictures but increasingly with young directors who would go on to important careers. Because of his large, shambling frame and uncertain command of English, he was often typecast as a villain in an American setting or an 'authentic' foreigner in the dozens of 1930s films that recreated a glamorous fictional Europe on the Hollywood backlot. In Frank Lloyd's Under Two Flags (1936), he was in the French Foreign Legion; in Howard Hawks' The Road to Glory (1936), a Russian sergeant in World War 1 France. His role as a comic showbiz caricature was also popular, especially in pre-Code backstage musicals, most famously as Mae West's lawyer in I'm No Angel (1933). It was in 1936, while he acted in six films, that Ratoff first moved behind the camera, co-directing (with Otto Brower) Sins of Man for Twentieth Century-Fox. He followed with his first screenwriting effort, Cafe Metropole (1937) and soon directed on his own with Lancer Spy (1937), starring Peter Lorre, Dolores del Río and George Sanders. 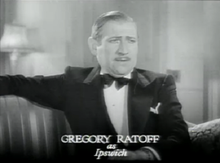 Ratoff directed five A pictures by 1939 under contract for Fox, while still acting on the side. He landed his most memorable film, Intermezzo: A Love Story (1939), when a harried David Selznick borrowed the prolific Ratoff from Fox to direct his new Swedish protege Ingrid Bergman in her American debut. The original director, William Wyler, had walked out after a quarrel with Selznick, whose hands were full completing his troubled Gone With The Wind and making newly arrived Alfred Hitchcock's first American film, Rebecca. The story was a remake of the Swedish film that had made Bergman a star, a tale of doomed love between a famous but married violin virtuoso (Leslie Howard) and his brilliant young piano accompanist (Bergman). Bergman was none too impressed with Ratoff, particularly since she was still struggling with English herself and found Ratoff difficult to follow. Ratoff, however, soon saw that "she is sensational", as he told Life Magazine. Leslie Howard had been talked into the part with the promise of a co-producer credit. This would be Ratoff's last Hollywood picture. Ratoff would never reach such heights again, and never entered the top ranks of Hollywood directors. He dropped acting and left Fox in 1941 for a Columbia directing contract. For the next decade, Ratoff directed comedies, musicals, crime dramas, war films, thrillers and swashbucklers—all solid but unspectacular fare in the wide range of genres then given to directors under contract. Song of Russia (1944), another love story between musical performers (Robert Taylor and Susan Peters) was set in Russia when the Nazi invasion begins. Ratoff had been lent out for this MGM job because the musical romance had become one of his specialties after his best-known work in Intermezzo. He actually collapsed near the end of shooting and had to be replaced by another emigre, Hungarian Laszlo Benedek. Taylor was a friendly witness for HUAC and its two writers were hauled before the committee, questioned and harassed. Ratoff's directing career in Hollywood never recovered and he returned to acting, playing his most famous role as the befuddled producer Max Fabian in All About Eve. Ratoff found his remaining opportunities outside of the US. An English comedy, Abdulla the Great (1955) which he produced, directed and starred in as a Middle eastern potentate, proved a complete failure, but his visibly low-budget film of Jo Eisinger's play, Oscar Wilde (1960) won plaudits for Robert Morley in the title role and Sir Ralph Richardson as the barrister who destroys Wilde on the witness stand. He was one of the two producers (with Michael Garrison) to have purchased and developed the original rights to the James Bond franchise from Ian Fleming in 1955, which subsequently became the subject of a bitter legal dispute. Ratoff was given his star on the Hollywood Walk of Fame in February, 1960, just months before his death. One of his last roles as an actor was in the epic film Exodus (1960), for Otto Preminger, a director with whom he had first worked in the early 1930s. Ratoff died on December 14, 1960 in Solothurn, Switzerland of cancer. His body was returned to the United States for burial at Mount Hebron Cemetery, Flushing, New York. Divorced from Leontovich since 1949, Ratoff was buried under a gravestone marked Beloved Husband. ^ Gregory Ratoff's petition for naturalization as a U.S. citizen and the Social Security Death Index both give his date of birth as April 20, 1893; however his mother's naturalization papers give his date of birth as April 7, 1895, and his gravestone bears the date April 20, 1897. ^ Sophie Ratoff death info from California, Death Index, 1940-1997, ancestry.com; accessed October 21, 2015. ^ Jeremy Arnold, "Symphony of Six Million"
^ Review: Oscar Wilde (film), nytimes.com; accessed October 21, 2015. ^ Oscar Wilde (film), imdb.com; accessed October 21, 2015. ^ J.C. Macek III (October 4, 2012). "The Non-Bonds: James Bond's Bitter, Decades-Long Battle... with James Bond". PopMatters. Retrieved 2014-03-29. ^ "Gregory Ratoff profile". Hollywood Walk of Fame. Retrieved 2014-03-29.